Learn more about the U.S. Marine Corps' long history of service. Sculpted from a famous photograph of the second flag-raising during the World War II battle for Iwo Jima, the monument honors all Marines who have given their lives in defense of the United States of America. Enjoy a concert played on the tower's 50 bronze bells. The carillon is a gift from the Dutch people to the American people in thanks for aid received during and after World War II. Discover the contributions of women who have served in or with the armed forces. Exhibits document their service, sacrifices, and achievements in a setting with panoramic views of Washington, D.C.'s monuments. Tour a 19th century plantation estate. Arlington House has been home to the Custis and Lee families, 63 slaves, a military headquarters, and a national cemetery. quotes from our 36th president. The park overlooks the capital and offers extraordinary views across the Potomac. Explore 2.5 miles of walking trails and a memorial to our 26th president. Landscaped by Frederick Law Olmstead, Jr. to resemble a climax forest, the island is a fitting tribute to one of America's great conservationists. Leave your bicycle at the racks. Reflect on the "strong souls and ready valor" of the United States Navy and Merchant Marine. Modernist Harvey Wiley Corbet designed its Waves and Gulls statue. Visit the museums and shops, or just wander along the cobblestone streets of Alexandria's historic district. See Virginia's last remaining river lighthouse. Built over a stone marking the original boundary of the District of Columbia, the Jones Point light guided ships up the Potomac. Watch for wildlife in this 485 acre wetland. The Haul Road Trail passes through a freshwater tidal wetland, a rare habitat in the Washington Metropolitan area and home to hundreds of species of birds. Leave your bicycle at the racks. Explore gun batteries and look for traces of a street P.O.W. interrogation camp. Fort Hunt defended Washington, D.C. from the Spanish navy during the Spanish American War. German prisoners processed there during World War II gave their interrogators that changed the course of war. In 1973, the National Park Service constructed the Mount Vernon Trail along the Potomac River, paralleling the George Washington Memorial Parkway. 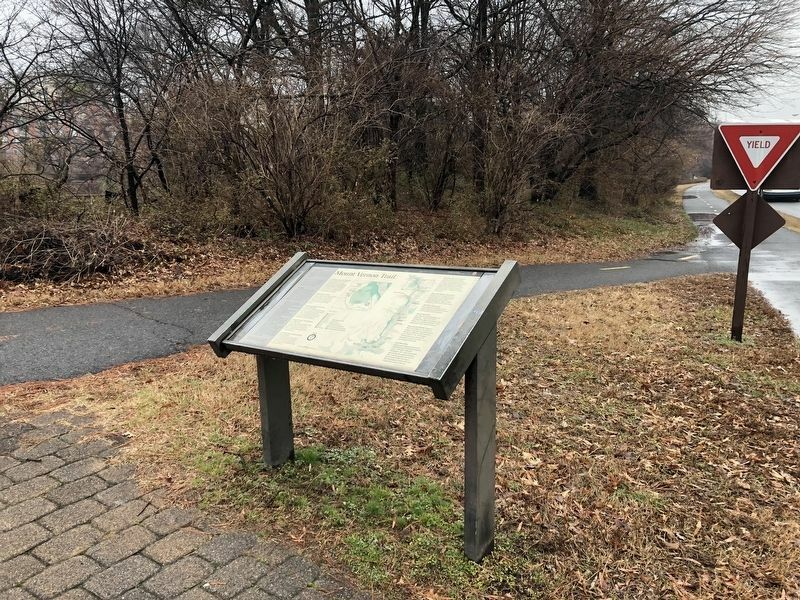 With the river as your companion, you can run, ride, or walk along this 18-mile multi-use trail stretching from the Mount Vernon Estate to Theodore Roosevelt Island. The Mount Vernon Trail is a very popular multi-use trail shared by bicyclists, runners, walkers, and rollerbladers. There are up to 80,000 visitors per month along the trail, and it can get congested. Here are some guidelines to follow to ensure your safety while visiting the park. • Be alert and be courteous. • Use caution when entering and crossing the trail. • Keep right and move off the trail when stopped. • Slow down before intersections and in congested areas. • Watch for children on the trail, and parents, be attentive to your child's activities. • Pet owners must keep pets on a leash no more than six feet long. • Ride, walk or skate single file; yield to slower users; and obey the 15 mph speed limit. • Bicyclists: Pass on the left. Before passing scan ahead and behind and signal with a bell or voice. Allow at least two bike lengths of room before moving back to the right. Do not pass when visibility ahead is limited. For maps and more information please visit www.nps.gov/gwmp. Location. 38° 50.507′ N, 77° 2.879′ W. Marker is in Arlington, Virginia, in Arlington County. Marker is on Mount Vernon Trail north of Four Mile Run Trail, on the right when traveling south. Touch for map. Marker is in this post office area: Arlington VA 22202, United States of America. Touch for directions. Other nearby markers. At least 8 other markers are within walking distance of this marker. Transportation (approx. 0.4 miles away); History at Four Mile Run Park (approx. half a mile away); Virginia's First Highways (approx. 0.6 miles away); Ronald Reagan (approx. 0.6 miles away); The Alexanders & Agriculture (approx. 0.6 miles away); Dr. Betty Louise Josephson King (approx. 0.6 miles away); The Custis Family (approx. 0.7 miles away); Abingdon Plantation (approx. 0.7 miles away). Touch for a list and map of all markers in Arlington. More. 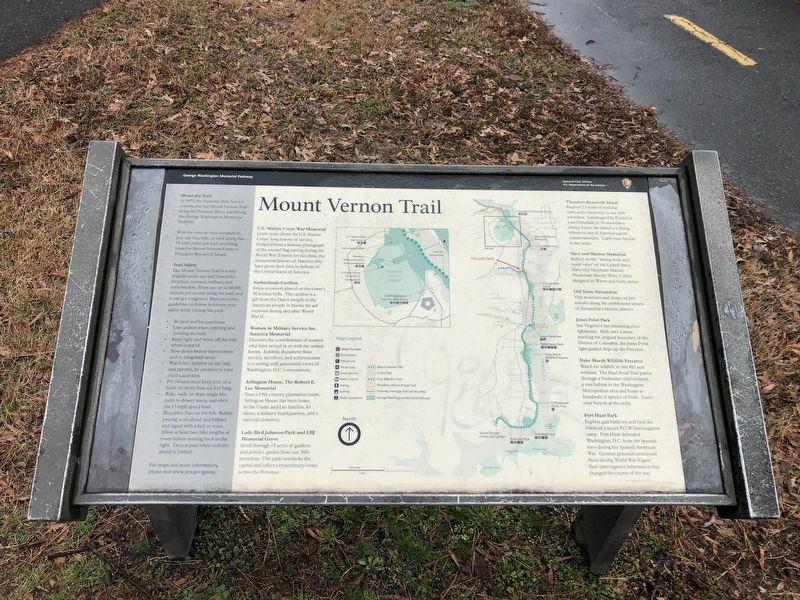 Search the internet for Mount Vernon Trail. Credits. This page was last revised on March 18, 2019. This page originally submitted on March 10, 2019, by Devry Becker Jones of Washington, District of Columbia. This page has been viewed 47 times since then. Photos: 1, 2. submitted on March 10, 2019, by Devry Becker Jones of Washington, District of Columbia.